Charmingly presented in a traditional 24" painted woven basket with faux leather straps, and named after the famous market town of York, Cartwright & Butler’s York Hamper is brimming with a first-rate variety of their best luxury products. The York hamper includes: Gouda Cheese Melts, Oat Cakes, Chocolate Wafer Crispies, Chocolate Wafer Rounds, Stem Ginger Biscuits, Lemon Curd, Soft Fruit Jellies, Salted Caramel Fudge in a Tin, Cafe York Blend Coffee, Butter Fudge, Dark Chocolate Gingers, Butterscotch Crunch, Tomato & Black Olice Bread Thins, Tea for Two Gift Tin with Earl Grey Tea and Pistachio & White Chocolate Shortbread. The Cartwright & Butler The York Hamper product ethics are indicated below. To learn more about these product ethics and to see related products, follow the links below. There are currently no questions to display about Cartwright & Butler The York Hamper. 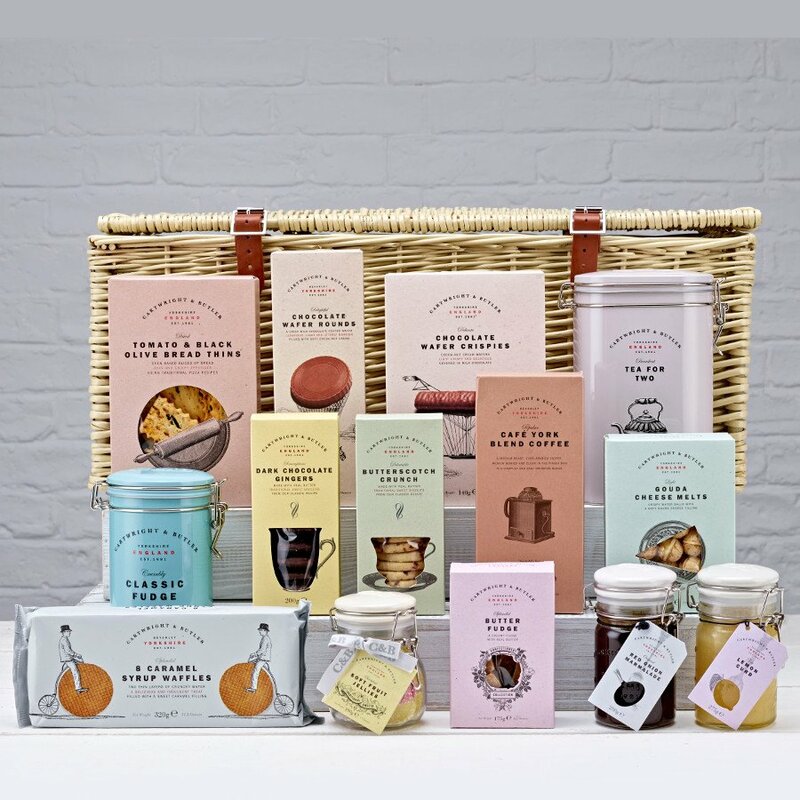 From humble beginnings producing jams and preserves in a rented room in a spice packing factory, Cartwright & Butler has developed as a brand, expanding its range to traditional preserves and luxury biscuits. Founded in 1981 in a small Yorkshire town, Cartwright & Butler still produce or pack products in the UK, while speciality flavours are produced in Europe for more authentic tastes. You’ll find Cartwright & Butler preserves and biscuits in all good delicatessens around the UK.